The African-American Civil Rights Movement was an ongoing fight for racial equality that took place for over 100 years after the Civil War. Leaders such as Martin Luther King, Jr., Booker T. Washington, and Rosa Parks paved the way for non-violent protests which led to changes in the law. When most people talk about the "Civil Rights Movement" they are talking about the protests in the 1950s and 1960s that led to the Civil Rights Act of 1964. The Civil Rights Movement has its background in the abolitionist movement before the Civil War. Abolitionists were people that thought slavery was morally wrong and wanted it to come to an end. Before the Civil War, many of the northern states had outlawed slavery. During the Civil War, Abraham Lincoln freed the slaves with the Emancipation Proclamation. After the war, slavery was made illegal with the thirteenth amendment to the U.S. Constitution. After the Civil War, many southern states continued to treat African-Americans as second class citizens. They implemented laws that kept black people separate from white people. These laws became known as Jim Crow laws. 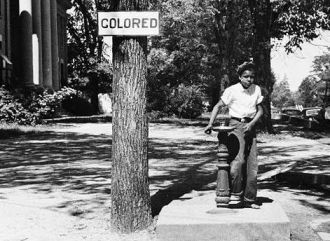 They required separate schools, restaurants, restrooms, and transportation based on the color of a person's skin. Other laws prevented many black people from voting. In the early 1900s, black people began to protest the Jim Crow laws that southern states were implementing to enforce segregation. Several African-American leaders such as W.E.B. Du Bois and Ida B. Wells joined together to found the NAACP in 1909. Another leader, Booker T. Washington, helped to form schools to educate African-Americans in order to improve their status in society. The civil rights movement gained momentum in the 1950s when the Supreme Court ruled that segregation in schools was illegal in the case of Brown v. Board of Education. Federal troops were brought in to Little Rock, Arkansas to allow the Little Rock Nine to attend a previously all white high school. The 1950's and early 1960's brought about several major events in the fight for the civil rights of African-Americans. In 1955, Rosa Parks was arrested for not giving up her seat on the bus to a white passenger. This sparked the Montgomery Bus Boycott which lasted for over a year and brought Martin Luther King, Jr. to the forefront of the movement. King led a number of non-violent protests including the Birmingham Campaign and the March on Washington. 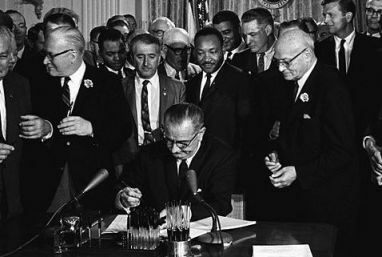 In 1964, the Civil Rights Act was signed into law by President Lyndon Johnson. This act outlawed segregation and the Jim Crow laws of the south. It also outlawed discrimination based on race, national background, and gender. Although there were still many issues, this law gave the NAACP and other organizations a strong base on which to fight discrimination in the courts. In 1965, another law was passed called the Voting Rights Act. This law said that citizens could not be denied the right to vote based on their race. It outlawed literacy tests (a requirement that people be able to read) and poll taxes (a fee that people had to pay to vote). The Civil Rights Act was originally proposed by President John F. Kennedy. The 1968 Civil Rights Act, also known as the Fair Housing Act, outlawed discrimination in the selling or renting of housing. The National Civil Rights Museum in Memphis, Tennessee was once the Lorraine Motel, where Martin Luther King, Jr. was shot and killed in 1968. Today, African-Americans have been elected or appointed to the highest positions in the U.S. government including Secretary of State (Colin Powell and Condoleezza Rice) and President (Barack Obama).